If you love horror,you've come to the right place! It's another entry in Panel Patter's Halloween Horror 2013! You can find all my entries by following this Halloween Horror tag. No man is an island, but Governor McCaw runs his domain as if it was entirely his. Ruthlessly controlling a small population outside mainland China, he'll stop at nothing to grow his power base, which includes a daughter he compares just a bit too much to her late mother. When he plans to sell a series of powders that are rumored to kill all that touch it, McCaw gets more than he bargained for as he faces treachery, double-crosses, and the knowledge that the needs of many might just be the flesh of each other. It's a tightly restricted world spiraling out of anyone's ability to keep control in Tim Gibson's Moth City. 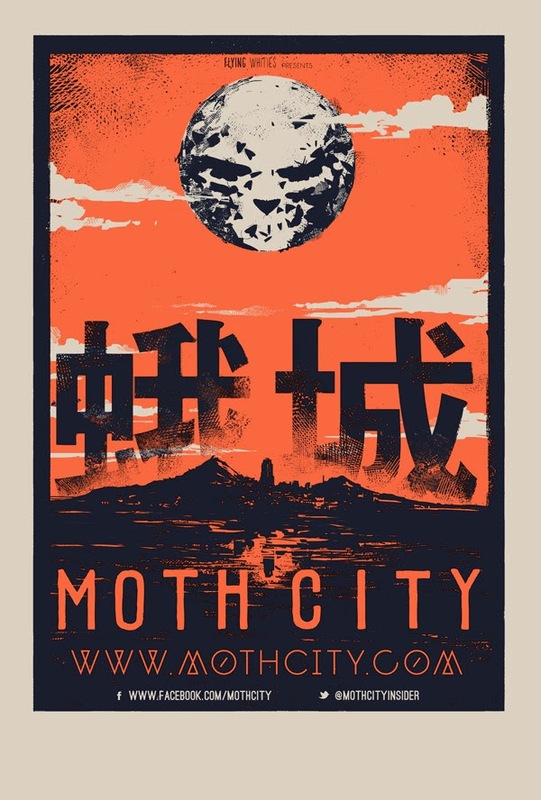 When you start reading Moth City, it doesn't have the look or feel of a horror story. There's nothing supernatural about the setting, just a pair of tin-pot dictators using the populace for their own ends, making racist remarks, and not noticing just how fragile their hold on power might be. Gibson quickly shows us this not so much by words as by the actions of the characters. While seemingly helpless, a group of prisoners are exchanging knives that later play a big role in driving the plot. Governor McCaw can't keep tabs on his own daughter, let alone a populace he dismisses later on in the series as being "sparkplugs" for all he cares. The story seems set to be a thriller about revolution, with the communist "threat" set up as the underdog heroes. And if that's all Moth City was, I'd love it to death and recommend it highly. Gibson, who has experience working with the likes of Peter Jackson, clearly knows how to craft a plot and keep it moving. But that wouldn't make it a good fit for Halloween Horror. The key to this comic and what makes it such a great horror story, is the way that the horror elements creep into the narrative, slowly and subtly. Before the reader knows it, there's people who should be dead cropping up and returning to the plot, making life harder for McCaw and his possible Chinese partner. They're slow to figure out what's going on, with the reader about a step or two ahead of them, even as Gibson keeps the story winding through twists and turns. By the time we hit issue five (the most recent one released), things have accelerated to the point that desperate measures are being planned to ensure that the horror of the flesh-eaters roaming McCaw's island is condemned and contained, even as he works to find a way to save all that his greed has cost him. 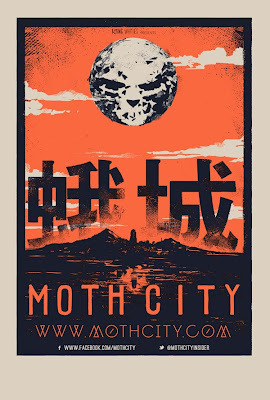 Gibson's put together an amazing slow-burn horror in Moth City, which isn't easy to do. Go too fast and you lose the point of holding things back. Go too slow and the reader's clicking off your comic and on to something else. In this case, the story hooks you by being a noir-ish thriller involving evil people and revolution, then when he's ready, Gibson pulls the rug out from under everyone with the revelation that we have zombies added into the mix. Now, hold it right there, I see some of you rolling your eyes. Yes, this story does have zombies in it, but there's two things you should know: 1) They're not the usual kind of zombies, these folks are not only smart, they're diabolically so and 2) They're more of a situation than the main storyline. Trust me, if this were a plain old zombie tale, I wouldn't be doing this review in the first place. Gibson is clever in his handling of the undead in Moth City, using them in a way that is innovative and intriguing. Plus, watching how the different characters deal with this unusual weapon of mass destruction ties the plot together and keeps it from just being another horror story with horrible people. It's not going to appeal to those who are entirely done with zombies, but I have a feeling by the time most readers encounter the flesh-eating in this story, you'll already be too hooked to stop, even if they aren't you usual cup of tea. I've said a lot about the story, so now let's get to the visuals. Gibson mentions on his "about" page that he's a big fan of David Mazzucchelli, and that shows. His work is minimalist and colored in the same shades that anyone who's read Batman: Year One (in the original version) will be instantly familiar with. You can tell where his creative influences lie, but that doesn't make him a clone of Mazzucchelli. His figures are more expressive and varied, for one thing, and there's a looseness to the overall style that gives it a more distinctive look. I also like the fact that despite this being a horror story with lots of violence, Gibson is very restrained his presentation. He's good at withholding just the right things to let the reader's imagination go wild (this is especially true in the creepy relationship between McCaw and his daughter) rather than spread blood all over the page. His settings are vivid and make me think of the time period (1930s China), and his Asian characters are varied in size, shape, and personalities. The most interesting part of Moth City, however, is how well it uses the digital medium. This is a digital comic in every sense of the word. Even in a downloaded PDF format (which is how I read my copy), the effects were clear to see and extremely well done, perhaps the best since Alex de Campi's Valentine. I really loved the way he did the narrative boxes, which come up, then disappeared as the images moved onto the screen, via a nifty system that uses the arrows on your computer to move from panel to panel. When viewing full-screen on a computer, it's just an amazing visual experience. Once you get used to the arrow system, you'll be amazed as characters blink, move across the screen, or even provide a bit of humor as situations are revealed. This is how a digital comic should be done. The tricks do not distract from or slow down the reading experience--they enhance it. It's a lesson that should be learned by others as we move into an era where some comics--not all, of course--are written for those reading on smaller screens or entirely online. I'm incredibly impressed by how Gibson manipulates things, since usually, I find digital-trick comics too gimmicky for my taste. Since Gibson has experience working with amazing directors in film (and de Campi, who also did this well, is also involved in film projects), perhaps this is one of those instances where the blending of the mediums creates the product. Moth City is available on Comixology, at Gibson's website, or on Thrillbent, so there are plenty of opportunities and options, based on your digital reading preferences. No matter what you decide, this book is a great story for both horror fans, those looking towards the digital frontier, and anyone who just wants to read a comic with a great plot, characters, and art.